Possibly, the only surprise about last night's vote was the scale of the defeat. With the noes taking 432 as against the ayes who garnered a mere 202, that put the prime minister 230 votes behind. Some of the smart money reckoned on her losing by less than a hundred. Wasting no time at all, though, Mrs May quickly pitched in to set out her government's position. "The House has spoken and the Government will listen", she declared, adding with delicious understatement: "It is clear that the House does not support this deal". The next points she made, though, were of considerable relevance to the ongoing debate. "Tonight's vote", she said, "tells us nothing about what it [the House] does support; nothing about how, or even if, it intends to honour the decision the British people took in a referendum that Parliament decided to hold". 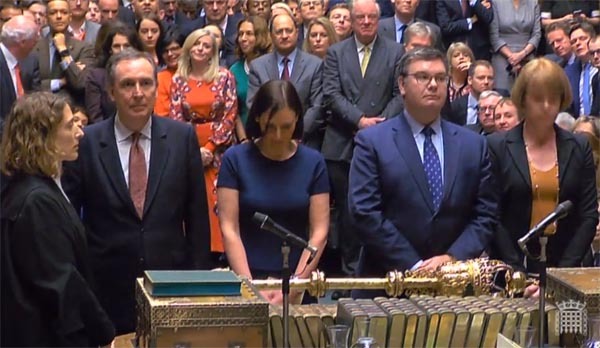 And now we go into a predictable regime, starting with a motion of no confidence that Mr Corbyn has obligingly tabled at the invitation of the prime minister. Thus, we can have the next instalment of the soap opera today, from which Mrs May is expected to emerge unscathed, putting the general election genie back in the bottle. For a follow-up, the prime minister will hold meetings with her colleagues, the DUP and then "senior parliamentarians from across the House to identify what would be required to secure the backing of the House". A "constructive spirit" will prevail but Mrs May is in no mood for playing games. Given "the urgent need to make progress", she is only prepared to entertain ideas "that are genuinely negotiable and have sufficient support in this House". What precisely those might be were not stated, but if the meetings yield such ideas, we are led to expect that the Government "will then explore them with the European Union". Before yielding the floor, Mrs May concluded by offering two reassurances. First, she was not playing for time, attempting to "run down the clock" in order to end up with a no-deal. Secondly, addressing "the British people who voted to leave the European Union in the referendum two and a half years ago", she expressed her belief that it was her "duty to deliver on their instruction". That, she intended to do. In terms of her demeanour, the prime minister did not come across as defeated. If she was "humiliated", as some would have it, she didn't show it. If anything, she seemed more determined and uncompromising than she had been before the vote. "Every day that passes without this issue being resolved", she said, "means more uncertainty, more bitterness and more rancour", before concluding with a call to Members on all sides of the House "to listen to the British people who want this issue settled, and to work with the Government to do just that". Nevertheless, she got little sustenance from Donald Tusk who, in an off-the-cuff tweet, asked: "If a deal is impossible, and no one wants no deal, then who will finally have the courage to say what the only positive solution is?" But the more considered response came in a formal statement from Commission president Juncker, who took note "with regret" of the outcome of the vote, while stating that, "on the EU side, the process of ratification of the Withdrawal Agreement continues". The Agreement, he said, was "a fair compromise and the best possible deal". The European Commission and Michel Barnier had "invested enormous time and effort" to negotiate it, and he, together with president Tusk, had "demonstrated goodwill again by offering additional clarifications and reassurances in an exchange of letters with Prime Minister". Juncker concluded by saying that the risk of a disorderly withdrawal had increased with the vote. "While we do not want this to happen", he said, "the European Commission will continue its contingency work to help ensure the EU is fully prepared". And, with that, he urged the UK "to clarify its intentions as soon as possible". It would not be possible to read into that any suggestion that the EU is prepared to consider further negotiations. But that does not stop The Times telling us that "it is understood" that EU governments are ready to reopen "all dossiers" of the Brexit deal. The newspaper also reports that, while Mr Juncker has flown back to Brussels from Strasbourg to be ready for "emergency" talks, Mrs May is expected to travel to Brussels "within 48 hours" for fresh negotiations to save her draft withdrawal agreement. UK media expectations appear to be centred on an extension of the Article 50 time period, with the Guardian having "EU officials" predicting that the first step will be for MPs to tell May to request an extension of the two-year negotiating period. This will remove the cliff edge of 29 March and set off a debate among the other 27 Member States on the terms of a prolongation. Yet, there was no hint of that from Mrs May in her addresses to the House yesterday. In closing the debate before the vote, she had unequivocally ruled out any of the options being touted, leaving us only with the deal that she was proposing. Her belief was that, with this, "we can lay the foundations on which to build a better Britain". Concluding that speech, Mrs May spoke of "the test that history has set for us today", telling MPs: "we each have a solemn responsibility to deliver Brexit and take this country forward", calling on the House "to charge that responsibility together". From now on, though, media noise will build to a crescendo and the sense of what Mrs May was saying will be lost. But there doesn't have to be any great perspicacity to realise what she is doing. If she is out of her depth with EU politics, she has proved herself adept at defensive manoeuvres on the domestic stage, and here she is quite clearly transferring blame for failure onto the MPs. In this, she can probably rely on there being far more support in the country at large for her as a person than there is for the braying rabble that constitutes the House of Commons. And if there is a single theme unifying the country, it is the desire to see Brexit over and done with. Deftly, Mrs May has put MPs in the frame. She can now afford to stand back and let them take the heat. As to the "colleagues", it is instructive to see Mr Juncker's comments on the "disorderly withdrawal" and his emphasis on not wanting it to happen. Despite the claims of French local politicians, and others, continental countries are far less prepared for Brexit than they would have us believe. My firm impression is that there has been a strong element of complacency. EU Member State governments (with the notable exception of Ireland) have been working on the premise that the Withdrawal Agreement will go through, buying them time to prepare their border controls and to make other arrangements. As a result, they are nowhere near ready for a no-deal Brexit on 29 March. On that basis, some of the front line Member States could actually welcome an Article 50 extension and the delay it brings – without necessarily wanting to see any other outcome from it. Six months to a year extra could transform their situations. At first sight, it might then seem counter-intuitive for Mrs May not to seek an extension. But she could gain a certain amount of leverage by refraining from making a request, forcing the Member States to take the initiative. This could enable her to extract just enough concessions to make the next vote in the Commons a more winnable proposition. Without putting too fine a point on it, though, there seems to be very little that Mrs May can do to make the Withdrawal Agreement more palatable to its critics. Her best bet, therefore, might be to tough it out, and dare MPs to tip us over the cliff edge. For sure, she can make the maximum use of the theatrical opportunities afforded by her jetting off to Brussels for "emergency" talks, complete with the long-expected drama of her returning with a "piece of paper" in her hand spelling out new concessions. Corny and transparent though this might be, it could be the face-saver that the Labour Party needs. With that, it could back the "new" deal against recalcitrant ERG "ultras". And if that much is speculation, it is no more or less so than the torrent of self-aggrandising clatter filling the legacy media. No one in all honesty can begin to predict where and how this is all going to end. But, in a perverse way, it can only end well for Mrs May. If she gets her deal, it is a famous victory. If she fails, she will go down in history as having tried her very best against insuperable odds, only to be blocked by an irrational parliament determined to force us into penury. That, by most normal measures, is a win-win. Would that they knew it, it is the MPs who are on the rack.